Corazon Aquino, former President of the Philippines, has died at the age of 76 from complications brought on by colon cancer. Aquino, leader of the non-violent "People Power" movement, was the first female leader of the country. 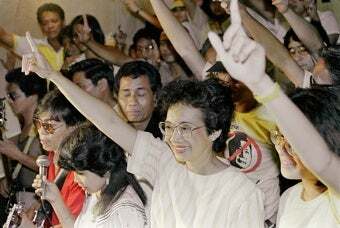 Affectionately known as "Tita Cory," Aquino rose to power in 1986, effectively removing Ferdinand Marcos from power through her campaign of nonviolent resistance that began when she returned to the Philippines after the assassination of her husband, Benigno Aquino, Jr., (who was himself attempting to remove Marcos from power) in order to lead his funeral procession; two million people marched alongside her. Once in power, Aquino faced, and withstood, six coup attempts over the course of six years. Though she left office in 1992, her legacy remains intact: "Ms. Aquino played a crucial role in Philippines history, moving the country to democratic rule through her nonviolent 'people power' movement over 20 years ago," White House Secretary Robert Gibbs tells the Associated Press. "Her courage, determination, and moral leadership are an inspiration to us all and exemplify the best in the Filipino nation."